The Red Coat: Jang Jane's Insubstantial Lover in "Love Me Do"
Mystic89 crooner Jang Jane’s “Love Me Do” is a saccharine, upbeat folk song that transports you to the streets of Paris. If the song started playing during Amélie, it wouldn’t be out-of-place at all. Jang Jane’s breathy vocalizations complement the acoustic guitar and electronic organ’s syncopated melodies. Musically, “Love Me Do” is a continuation of her song “Eat” that came out earlier this year, with the same Francophile influences and breathy vocals over an acoustic guitar. The instrumentation of “Love Me Do” is fairly simple; the two driving instruments are her acoustic guitar and an electric organ. The simplicity is what makes this song so elegant; her voice mixing with the acoustic guitar and organ creates a carefree atmosphere. 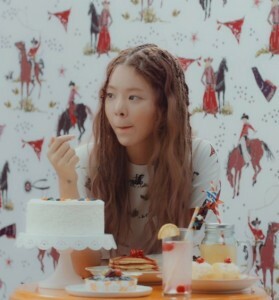 Jang’s voice and the instruments support each other, showcasing her talent as a song writer and musician. You give me pain so you’re even sweeter…I can’t have all of you so it’s even more thrilling. Even though Jang is happy to be with her lover, she sings consistently about how they will never be hers. It doesn’t seem to bother her that her lover doesn’t love her the way she loves them; she even calls their relationship a “black comedy,” saying that they will disappear if she tries to catch them. In the last full verse Jang tells her lover that even though their love has filled her, she doesn’t want them to take full control; rather, Jang wants to stand on her own. So even if she is consumed by them, she still acknowledges she wants to be her own person. On top of her lover being unattainable, Jang often describes her experiences with them as either fleeting or evanescent. Jang clearly knows that soon they’ll leave her and if she tries to get them to stay, she’ll be the one hurt in the end. Even if their love won’t last, Jang doesn’t seem to be concerned; their relationship fills her and makes her feel good. The video itself acts as a reflection of the whimsy Jang tries to evoke in the music. Set in a Western-themed room, Jang is seen at various points searching through a large box full of clothes and writing what one assumes is a love letter. The flimsy nature of the romantic relationship is excellently demonstrated with the use of balloons, and when Jang finds a red coat and pretends it’s her lover. She flirts with it and it even gives her a glass of red wine to enjoy. As she continues to enjoy the company of her stand-in lover, we see a large balloon raise the coat, eventually popping after Jang declares that she wants to stand on her own. By having the balloon pop and the coat fall, the video complements the insubstantial feelings Jang described earlier in the song about her lover; they are barely there, and then disappear quickly. The art direction for the video is excellent; the muted color palette and simple set help add to the feeling of airy feeling Jang has been favoring in her recent MVs. “Love Me Do” has the same direction and editing that “Eat” has. Both videos center heavily on a solitary Jang in soft focus and gauzy colors, with long single shots of her either playing an instrument or lounging around the set. It’s a departure from her older videos where she was shown doing more than playing her instruments and floating about. I think it’s likely Jang has been given more creative control, since the overall style feels more natural, more innately “her” than some of her older material. It’s a charming video about an absent lover and semi-unrequited love. The whimsical set design and wardrobe emphasize Jang’s unique voice and writing style. “Love Me Do” doesn’t offer us anything new, but it is still a lovely song to enjoy if you feel like wandering through your favorite park or city. 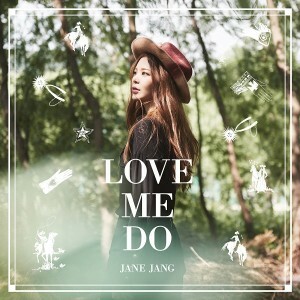 Hopefully this isn’t the last of what Jang Jane has to offer for this comeback and we’ll get to hear more from her.